http://www.JewishWorldReview.com | New Year's Day marks the 55th anniversary of Cuba's communist revolution. It is the oldest - indeed the only - full-blown dictatorship in the Western Hemisphere. As Human Rights Watch noted in April, no other country in Latin America is ruled by a regime that "represses virtually all forms of political dissent." More than half a century after Fidel Castro seized power with the promise that "all rights and freedoms will be reinstituted" - and more than seven years since Ra�l Castro succeeded his brother as tyrant-in-chief - Cuba is consistently rated "Not Free" in Freedom House's annual index of political and civil liberties worldwide. 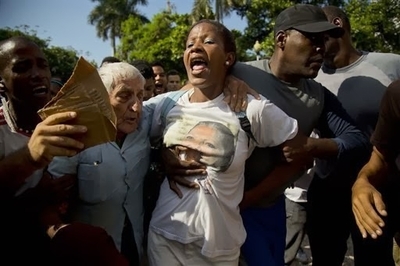 Cuban security agents in Havana drag away a member of Ladies in White, one of hundreds of dissidents forcibly detained when they tried to commemorate International Human Rights Day on Dec. 10, 2013. "Authoritarian state" � "Communist Party the only legal party" � "elections were neither free nor fair" � "government threats, intimidation, mobs, harassment" � "record number of politically motivated [and] violent short-term detentions." President Barack Obama paused to shake hands and speak with Cuban dictator Raul Castro at Nelson Mandela's funeral in South Africa. 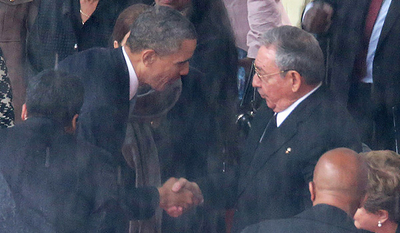 The handshake took place on the same day that Castro's thugs were cracking down on nonviolent dissidents across Cuba. A president who has sworn to "never, ever compromise the cause of liberty" might speak out, for example, about the fate of Roberto Amelia Franco Alfaro, who was warned by the police to stop opposing the government - and then disappeared when he wouldn't. He might call attention to the death of Sergio Diaz Larrastegui, a blind human-rights activist who was threatened with revenge if he wouldn't turn informer - then fell abruptly, fatally ill. There have been scores of such cases in recent years, many thousands in the last few decades.